When the Lord turned again the captivity of Sion: then were we like to those that dream. Then was our mouth filled with laughter: and our tongues with joy. Then said they among the heathen: The Lord hath done great things for them. Yea, the Lord hath done great things for us already: whereof we rejoice. Turn again our captivity, O Lord: as the rivers in the south. They that sow in tears: shall reap in joy. He that goeth forth and weepeth, bearing precious seed: shall doubtless come again with joy, and bring his sheaves with him. For of gods he is the God. I will lift up mine eyes unto the hills: from whence cometh my help. My help cometh even from the Lord: who hath made heav’n and earth. He will not suffer thy foot to be moved: and he that keepeth thee will not sleep. Behold, he that keepeth Israel: shall neither slumber nor sleep. So that the sun shall not burn thee by day: neither the moon by night. The Lord shall preserve thee from all evil: yea, it is even he that shall preserve thy soul. The Lord shall preserve thy going out, and thy coming in: from this time forth for evermore. There is no truth save only in thy trust. And bring thro’ Christ to him for whom are all. Who art and shalt be worshipp’d evermore. And lead us to enjoy thy heav’nly light. My soul looketh for the Lord, more than watchmen look for the morning. Let Israel hope in the Lord, for with the Lord there is mercy: and with him is plenteous redemption. Jesus, sunshine of my heart! Thou the true Redeemer art! He stands for ever: Alleluia! Nought can us sever. Alleluia! and he shall smite the earth with the rod of his mouth, and with the breath of his lips shall he slay the wicked. and the calf and the young lion and the fatling together; and a little child shall lead them. for the earth shall be full of the knowledge of the Lord, as the waters cover the sea. And in that day there shall be a root of Jesse, which shall stand for an ensign unto the people: and his rest shall be glorious. Peace be in thee, I’ll say. I’ll seek thy good alway. Then the proud waters had gone even over our soul. Blessed be the Lord, who hath not given us as a prey unto their teeth. Our soul is escaped even as a bird from the snare of the fowlers: the snare is broken, and we are delivered. Our help is in the name of the Lord, who made heav’n and earth. If with his love we befriend thee. I came forth from the mouth of the Most High, and cover’d the earth as a mist. I dwelt in high places, and my throne is in the pillar of the cloud. Alone I compassed the circuit of heav’n, and walk’d in the depth of the abyss. In the waves of the sea, and in all the earth, and in ev’ry people and nation, I got a possession, with all these I sought rest. And I took root in a people that was glorified, in the portion of the Lord’s own inheritance. I was exalted like a cedar in Libanus, and as a cypress on the mountains of Hermon. I was exalted like a palm tree on the sea shore, and as a fair olive tree in the plain. And my branches are branches of glory and grace, and my flow’rs are the fruit of glory and riches. Come unto me, ye that are desirous of me, and be ye filled with my fruits. And lo, my stream became a river, and my river became a sea. For my thoughts are fill’d from the sea, and my counsels from the great deep. With words from the wisdom literature of Ecclesiasticus chapter 24, A Song of Wisdom, the last of the Six Bible Songs, Op 113, dates from 1909 and was written for the soprano Agnes Nicholls, renowned at that time for her major roles in opera and oratorio. 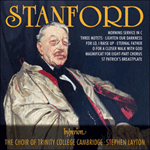 Stanford’s Bible Songs occupy a unique place in English church music in that they clearly have connections with the secular Lieder tradition, yet, with organ accompaniment (which is itself more expansive and symphonic in design and structure) the songs seem to take on the apparel of a short solo cantata, particularly when they are sung with the additional ‘hymn anthem’ at the conclusion. For my thoughts are fill’d from the sea, and my counsel from the great deep. 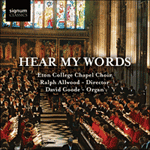 As an apposite counterpart to ‘A Song of Wisdom’, Stanford composed the pastoral essay O for a closer walk with God (based on the Scottish Psalter tune Caithness and William Cowper’s words) with an organ accompaniment derived from the thematic material of the ‘song’. Although well known as a free-standing anthem, O for a closer walk with God was originally designed to accompany (as an optional concluding statement) the last of Stanford’s Six Bible Songs, Op 113, ‘A Song of Wisdom’. 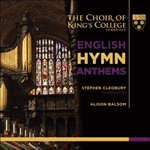 Indeed, the anthem formed the last of Six Hymns each of which was based on a familiar hymn tune. The source of O for a closer walk with God was the Scottish Psalter (1635) with words by W Cowper allied with the old Psalm tune Caithness. 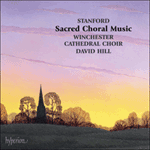 Using three verses (1, 3 and 5) from the original five, Stanford shaped a chorale fantasia around the melody in which the intricacies of harmony, counterpoint, phrase-length, register and organ accompaniment are manipulated with increasing dexterity, particularly in the highly expressive final verse (‘So shall my walk be close with God, Calm and serene my frame’) with its combination of fervour and spiritual confidence. 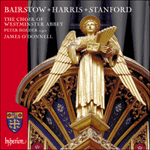 Unlike Parry, Stanford made it his business to provide up-to-date music for the Anglican choral service. But this piece had a different origin. 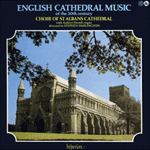 In 1909 he published Six Bible Songs for solo voice and organ (Op 113). Their specific purpose is unknown: to Jeremy Dibble ‘they come across as a cycle of solo cantatas’. Stanford was apparently dissatisfied with the result. The next year he added Six Hymns for choir and organ, using existing tunes; each was intended to follow one of the songs. This one was attached to No 6, ‘A Song of Wisdom’ (based on Ecclesiasticus xxiv). Its text is verses 1, 4 and 6 of a poem by William Cowper (1731–1800), written in 1769: the opening words refer to Genesis v. 24. Stanford used the simple tune which had been adopted for this text in HA&M: Caithness, from the Scottish metrical psalter of 1635. The first verse is a plain setting for trebles and organ; the other two are harmonically varied for SATB, with some extensions. The organ supplies an introduction and coda. Contrairement à Parry, Stanford prit sur lui la tâche de procurer au service choral anglican de la musique nouvelle. L’origine de cette pièce, cependant, est à chercher ailleurs. En 1909, il publia Six Chants Bibliques pour voix et orgue (op.113). Leur intention spécifique est inconnue; pour Jeremy Dibble «elles semblent constituer un cycle de cantates pour soliste». Stanford ne fut apparemment pas satisfait du résultat, et l’année suivante il ajouta Six Hymnes pour chœur et orgue, en utilisant des airs existants, chaque hymne devant faire suite à un des airs. Celui-ci était attaché au numéro 6, «A Song of Wisdom» (d’après l’Ecclésiate, xxiv). Son texte reprend les strophes 1, 4 et 6 d’un poème de William Cowper (1731–1800), écrit en 1769; il commence par une référence à la Genèse, v. 24. Stanford utilisa l’air limpide adopté pour ce texte dans HA&M: Caithness, issu du psautier écossais versifié de 1635. La première strophe est composée simplement pour sopranos et orgue; les deux autres, harmoniquement variés, sont écrits pour toutes les voix, avec quelques extensions. L’orgue se charge également d’une introduction et d’une coda. Anders als Parry machte es sich Stanford zur Aufgabe, dem Anglikanischen Gottesdienst zeitgemäße Chormusik zu liefern. Aber dieses Stück hat einen anderen Ursprung. 1909 veröffentlichte Parry Six Bible Songs—(Sechs biblische Lieder) für Solostimme und Orgel (Op. 113). Der spezifische Zweck dieser Lieder bleibt unbekannt: Jeremy Dibble meint, dass sie „wie ein Zyklus von Solo-Kantaten wirken“. Stanford war scheinbar mit dem Ergebnis unzufrieden. Deshalb fügte er im darauff olgenden Jahr Six Hymns—(Sechs Loblieder) für Chor und Orgel hinzu, wobei er bereits bestehende Melodien einsetzte; jede davon sollte auf eines der Lieder folgen. Das vorliegende Werk war der Nummer 6 zugeordnet, A song of wisdom—(Ein Lied der Weisheit) (Ecclesiasticus xxiv). Der Liedtext besteht aus den Versen 1, 4 und 6 eines Gedichts von William Cowper (1731–1800), das 1769 geschrieben wurde: die einleitenden Worte beziehen sich auf Genesis 24. Stanford verwendete dazu die einfache Weise Caithness, die für diesen Text im Kirchengesangsbuch HA&M vom schottischen metrischen Psalter von 1635 übernommen worden war. Der erste Vers hat einen schlichten Aufbau für Knabensopran und Orgel; die zwei andern sind für SATB harmonisch variiert, mit gewissen Ergänzungen. Die Orgel liefert eine Einleitung und eine Coda.